The Dodge Challenger is ready to make your drive exhilarating in Athens, TX. Take a test drive at Palestine Chrysler Dodge Jeep Ram FIAT today to begin your thrill. Get ready to re-evaluate everything you believe a muscle car should be. The Dodge Challenger defies everything you know about traditional muscle cars and perfectly pairs power and performance with style and comfort. Are you ready to get to know your Challenger? Make your grand entrance at Palestine Chrysler Dodge Jeep Ram FIAT and drive away in style. When it comes to performance and power, many muscle cars on the market claim they are king, but only one car can truly claim that title and that car is the Dodge Challenger. It takes on the competition and delivers the power you want when you need it. After all, it does have the powerful Supercharged 6.2-liter HEMI Hellcat SRT V8 engine that is unsurpassed by the competition. This bad boy gives you a whopping 707 horsepower and 650 lb-ft of torque so you can crank it hard around the corners and pin the needle every chance you get. Beat anyone from the line and feel the thrilling exhilaration that can only be had from a HEMI. If you want nostalgia from your youth, you need the Challenger and you won’t be disappointed with the performance it delivers. With the Challenger, you can choose from up to four different suspension types to truly customize your driving experience. Are you ready for a thrill? Make it happen at Palestine Chrysler Dodge Jeep Ram FIAT today. Let’s face it, the classic muscle cars look amazing and bring back memories like no other, but they aren’t really that comfortable to drive. Enter the Dodge Challenger. The Challenger gives you the creature comforts you want for a long drive or a jaunt to the office. It keeps the classic muscle car feel inside and out but adds the necessary comfort you don’t want to live without. With the weather that can change at a moment’s notice, you need to be in control of your interior climate. The Challenger features both heated and ventilated seats that can be activated with the flip of a switch to warm you up when it is cold outside and to cool you down when mother nature turns up the thermostat. Even the steering wheel is heated to quickly warm your hands. The Challenger even offers technology unlike its predecessors to help you enjoy your drive. The Uconnect system gives you everything you need at your fingertips from navigation to satellite radio. Do you want to know more about these features? Come and see us at Palestine Chrysler Dodge Jeep Ram FIAT. Are you ready to find the Dodge Challenger of your dreams? 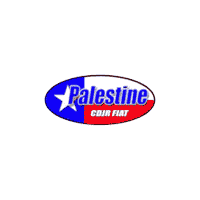 We are here to help at Palestine Chrysler Dodge Jeep Ram FIAT. We have your Challenger waiting for you. We will help guide you through the car buying process to make it as painless as possible. Our team of professionals will always greet you with a friendly smile and treat you with the integrity, honesty, and respect you deserve. You can feel confident you will always get a great deal when you shop with us and our finance team will work hard to help you get the approval you deserve so you can drive home in the Challenger of your dreams. We are here to serve you by phone, online, or in person so don’t hesitate to contact us with your questions. Did you know we can even maintain your Challenger after the sale in our state of the art service center? Contact us today to get started. We look forward to serving you as we work hard to earn your business.